The Costanoan Rumsen Carmel People maintain the cultural traditions and values by teaching our children the ways of dancing through ceremony. Many of the dances are performed at schools in order to teach other children about multi-cultural issues. 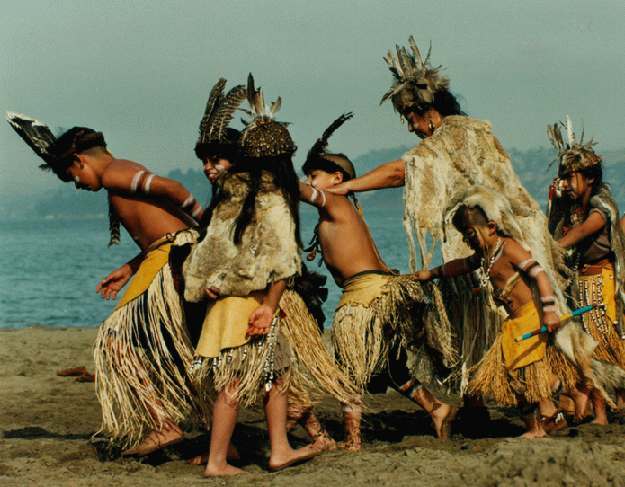 Some of the dances are danced because of our beliefs in the "power" of dancing and of keeping good health. If you are interested in having the dancers come to your school or organization, please contact the Tribal Offices by telephone at the number listed below. Dancers line-dance during the 8th Annual "Big Time" Ohlone Pow wow. Gloria Castro and Rosie Parra, tribal recognized elders in ceremonial dance. These pages are hosted on NativeWeb and maintained by Charles P. White. All content, including but not limited to images, photos, artwork and text, is copywrited (c) 2001, by the Costanoan Rumsen Carmel Tribe, or various individuals as documented in the web page tribal records. Please obtain permission before posting, or republishing any content from this website.